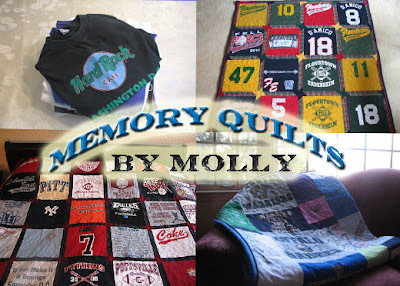 Congratulations, you have ordered a one-of-a-kind Memory Quilt by Molly! Now that you have gathered the garments, filled out the order form, and sent the package to me, you get to sit back and relax. What you can expect from me after your order is placed: Lots of emails with lots of pictures! an "initial layout" email with a digital picture attached that illustrates the position of the shirts for the quilt. At this point you are encouraged to make changes if necessary. a "second layout" email with a digital picture attached showing all shirts cut into blocks. Changes are encouraged at this point, if necessary. sashing fabric colors are chosen at this point. More digital pictures of fabric choices and colors will be sent to you via email. once the layout is approved it becomes the "final layout." I begin sewing the top quilt. Once finished, a fifth email is sent with a digital picture attached of the finished top quilt. At this point backing fabric and color is discussed and chosen. once the t-shirt quilt is quilted using a longarm quilting machine, a sixth digital picture is sent to you. Your final bill will need to be paid at this point. a seventh email is sent with a digital picture of the finished quilt, binding and all! the final email that I send is the forwarded UPS tracking email so you can track your Memory Quilt! If you prefer to talk via phone I am available for that too! There are no surprises in this process. I encourage my customers to become involved in the t-shirt quilt design. "I see your emails arrive and I feel like it's Christmas! I can't wait to see what you've created. This exceeds what I had hoped it would be!!! I think the pink polka-dot backing is just perfect and she will love it. It is similar to the backing on a quilt her grandmother made her when she moved from a crib into a twin bed. And yes, Pooh is perfect as is the preschool dress, etc. Love it!!!! When I first began bagging every stitch of important clothing for both the kids I originally thought I would be making the quilts. I can make a basic log cabin Quilt in a Day so I knew something of this detail would be over my head. But I kept holding the clothes hoping at the right time I'd find the right person--I did! I'm already thinking about future projects--I'd like to use their baby clothes so that we can make one baby quilt for each of them for when they have their first child. Oh, and we can't forget about that silly Broadway quilt...maybe for her 21st birthday. I hope you plan to stay in business a few more years!!" 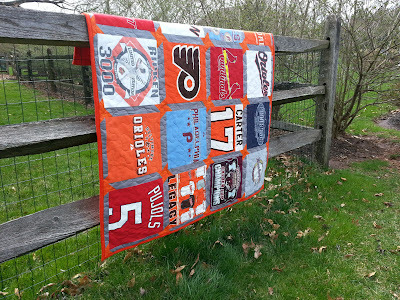 End result: A beautiful T-shirt quilt that is exactly how you envisioned it. You or your loved one will cherish this Memory Quilt for years to come!